Building a diversified real estate portfolio overseas isn’t easy. In addition to the time it takes to scout countries and identify properties for purchase, you also need a fair amount of cash, as financing isn’t an option in many countries (and isn’t easy in some where it is available). To be invested in even two properties, you’d need at least US$100,000… and that would get you a hectare of agriculture and maybe an investment lot in a development or possibly a very small rental apartment somewhere. Another option for broader diversification is through a development company with projects in multiple countries. Most real estate developers focus on one country, meaning that, even if they have several projects going and allow investors to participate in them all, your diversification is still limited. One development company I know is operating in multiple markets. Their target buyers are North Americans, specifically North American retirees. This group has taken an approach similar to that of Del Webb when he broke out of Arizona and started building for retirees in multiple U.S. states. The marketing strategy is straightforward—sell the customer what he wants rather than what you have. To that end, this group is developing expat retiree-friendly projects in Belize, Nicaragua, Costa Rica, and Panama. They are working to add additional development communities in other countries where American and Canadian retirees are focusing their attention, including Ecuador and Chile. Because you’re reading this letter, I assume you get the big-picture premise at work behind this group’s strategy. Retiring overseas (as you know) is a fast-growing idea whose time has come. The challenge for many retirees considering their options overseas is finding housing of North American standards at better or even the same pricing as back home. Construction materials in Central and South America don’t cost much less and can even cost more than in North America. It is lower land values and cheaper labor costs that mean housing can be less expensive than up north. It’s possible to buy super-cheap housing South of the Border if you’re ready and willing to go local. However, local housing in Latin America can be a shock for the North American buyer. Going local can mean going without hot water, without air conditioning, without a washing machine or dryer, without a fitted kitchen, etc. North American retirees considering options beyond North America are looking for a better lifestyle for less money, not to downgrade and make do. Throughout Latin America you can also find housing that even high-maintenance North Americans would find comfortable, even luxury-level. This standard of housing, though, comes at a premium in Central and South America. The gap in this part of the world is in the middle. The middle class is a relatively new idea in most of Latin America, so available housing stock is usually of one extreme or the other, either basic or very high end. The goal of the development group I’m speaking about is to fill that middle-class housing gap for retirees interested in reinventing their retirements somewhere foreign that’s also beautiful, welcoming, and affordable. The market is definitely with this group. A survey carried out a few years ago by Zogby calculated that about 1.5% of the U.S. population is considering retiring or buying a second home in Latin America. That’s about 4.5 million people. A large gated community development in Central America might have up to 1,500 addresses, and there aren’t many quality developments of that size and fewer still targeting expat retirees. Of course, not all of those 4.5 million want to go to the same country. Not all of those potential buyers want to be at the beach… or the mountains… or in a city. Some may not know where they want to go until they see something that they like. The group I’m talking about is developing not only in different countries, but also in diverse locales to better serve as much of this broad and growing market as possible. It’s great news if you’re a retiree looking for quality housing at a reasonable price for your retirement overseas. But I’d say it’s even better news for the investor looking to build a diversified foreign property portfolio. This group makes it possible to achieve that objective with a single investment. The investment is directly with the developer. 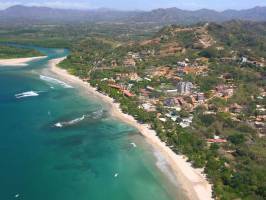 You don’t own any property directly, but you own a part of everything the development group owns, which right now includes 5 miles of beachfront on both the Pacific and Caribbean coasts of Central America. The company has been operating for 15 years and raises funds for expansion, not operations. Revenues from the existing business cover overheads, with the balance paid out in dividends. New capital goes toward expansion into new markets and additional properties. The company wants to be serving the expanding baby boomer trend of retiring overseas for the next 20 years. The one downside is that you must be an accredited investor to participate. That means you have to have US$1 million in net worth outside of your primary residence or be able to show US$200,000 per year in income on your tax return for each of the last two years (US$300,000 with your spouse). The minimum investment is US$50,000. This is a turnkey option for getting in on a major trend while gaining instant diversification. It’s the only option I know for building a no-hassle foreign property portfolio. For more details, please get in touch here. We’re looking to Medellín and intend to purchase while the dollar is strong. Having never done anything like this (I’m only 44), is there any way to convert my U.S. dollars to Colombian pesos and put it in a holding account for a spell? We’ll be there in June or July and plan to move after October. Excellent question. You can lock in today’s exchange rate by moving money to Colombia now and keeping it in a Colombian peso holding account of some kind. I have both a liquid savings account in pesos as well as a couple of certificates of deposit. The CD interest rate varies, and, over the past two years, I’ve earned between 4.29% and 6%. My liquid savings account is earning 4.55% at this time. Both accounts are available from the Colombian brokerage Alianza Valores. If you’re interested in opening one, contact Angela Sanchez, and she’ll be happy to send you information on what they offer. Once you decide to buy something in Colombia, Angela can distribute the funds as per your instructions. Ken, I have been to all these places many, many, years ago. I would not go there now if they gave me a villa. It is almost like Libya is today. These articles do not tell you what is really going on there. Well, consider me enlightened. Libya must be a lot nicer today than I’m hearing on the news, if people are strolling the beaches, enjoying the fine dining, and trying out some of the world’s best sport fishing. And there’s one other interesting point I’ve notice over the years. Expat citizens from the countries we write about almost never like their home country as well as the expats who settle there do. When I left the United States for Ecuador in 2001, my Ecuadorian friends in the United States thought I was crazy. And then, while living in Uruguay, I heard from many U.S. Uruguayans who felt their home country had gone to hell since they left in the 70s. And, now that I think about it, new immigrants to the United States have a much better appreciation for America than most Americans living abroad do. Maybe it takes fresh eyes to appreciate what a country has to offer. Have a question? You can write to Lee and Lief here.